Guldkorn Expressen til Commodore 64, en Dansk klassiker! 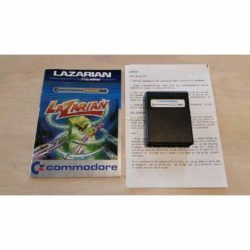 Et stykke dansk historie til Commodore 64, her komplet med original kasse, kassen er i utrolig god stand. Produced as a product tie-in with OTA’s honey puff cereal, Guldkornexpressen (or Kalaspuffsexpressen) revolves around the brand’s bear mascot, who drives a train filled with honey puffs. His task on each level is to pick up boxes of the cereal, add honey and drive the train to the end of the level, where the cargo is loaded into a big box of Guldkorn. It is not just a straight forward career along the tracks, though. Switches must be set back and forth for the train to go on the right tracks, there are rocks and fallen trees on the track, and you must keep your speed so as not to crash into things. Fortunately for Puff the bear, he has a honeybee friend. By tapping the joystick button, you activate the bee. It is the bee’s task to activate the switches and to operate the honey tap. If you hold in the joystick button, you activate an action menu to deal with obstacles. You can choose to jump over fallen trees, throw dynamite at rocks or to let the bear jump out and dig away dirt from the tracks.